A couple of weeks ago, I showed you a rather wonderful clay mask called Clayspray. I also mentioned in that post that I had a fantastic budget alternative to share with you, and here it is: Amie Spring Clean Cooling Clay Mask*. Amie skincare products are created with a plethora of gentle, natural ingredients – an impressive average of 95% natural ingredients in each product – and a big dose of love, aimed primarily at young and troublesome skins (a category I can count myself in!) but loved worldwide by ladies (and men!) of all ages. The whole range is super affordable, with not one single product costing more than £5.95. 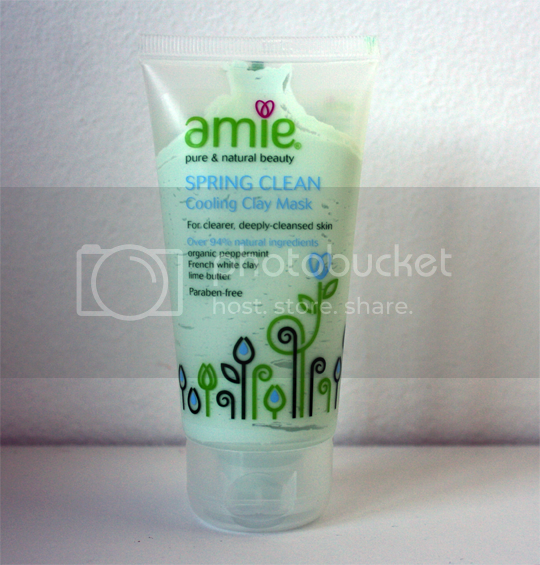 My personal favourite is the Amie Spring Clean Cooling Clay Mask, which costs a measly £4.95. This clay mask is beautifully refreshing and yes, cooling as the name would suggest. Drawing out deeply lodged impurities and dirt, and soaking up excess oil with ease, it works in a very similar way to its much more expensive Clayspray counterpart. Its key ingredients include French white clay for the deep cleaning; natural zinc oxide for its antibacterial properties; lime butter to tone and give moisture to the skin and organic peppermint which is where the gloriously cool and refreshing feeling comes from. As with any other clay mask, smooth a thin layer over the face and allow to dry before washing off with warm water and a flannel. It terms of results, my skin’s clarity is always noticeably improved after using Amie Spring Clean Cooling Clay Mask and I honestly find the results very, very similar to the Clayspray mask. For one ninth of the price of Clayspray, you’d be a fool not to give this one a whirl. It really is good stuff! It might not feel quite as luxurious and decadent to use, but if the results are largely the same it’s a bit of a no-brainer, isn’t it? Amie Spring Clean Cooling Clay Mask is available from John Lewis and Waitrose stores, and you’ll find it in plenty of online stores including CutECOsmetics and Victoria Health (where I notice it’s been marked up by 15 pence!). Oh, and while you’re there, take a look at the New Leaf Skin Exfoliating Polish too – another gem! Have you tried anything from Amie Skincare before? Anything else I should be taking a look at? I got a full size New Leaf skin polish in my June Beauteco box, and fell in love with it. Not just the results, but the smell, it’s so yummy! I am already fighting the urge to buy more, and I think this will be at the top of my list now!